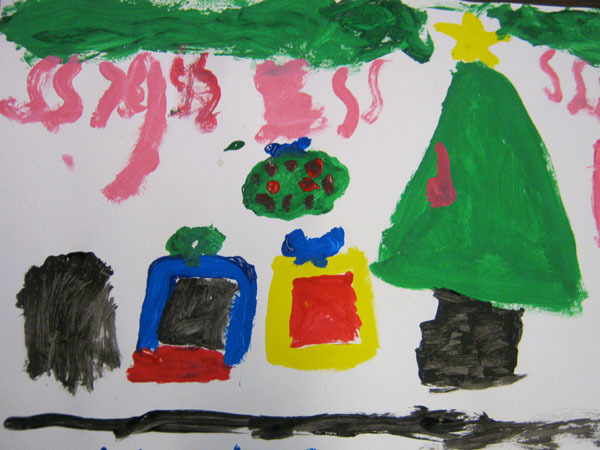 The project this day, the friday before the last (half) week of school before winter break, was to work on using color to paint about what we like about the holidays. 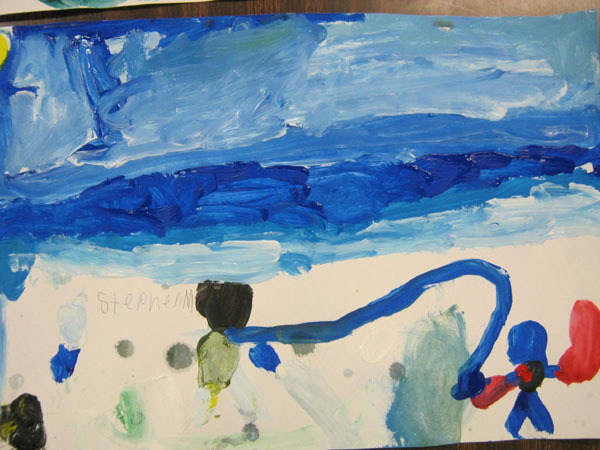 This is a second-grade class at Keet Gooshi Heen school in Sitka, Alaska. It is a wonderful group of kids – kind and thoughtful and hard workers. 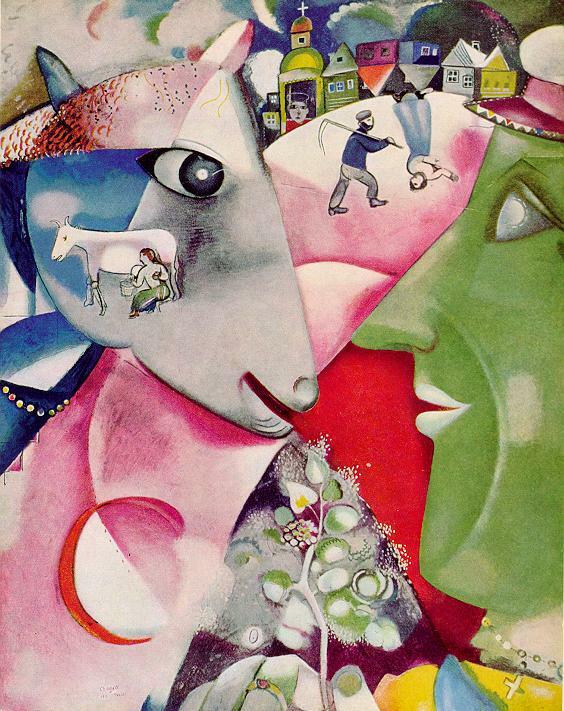 I spent some time finding images and information about Marc Chagall (1887-1985), who was a Russian-born Jewish artist, who took for his main subject his memories of the village where he grew up. His pictures are colorful and full of life. His work is popular, but he also happened to be a major Modern artist, exploring and synthesizing the various movements in Europe before and after WWI. 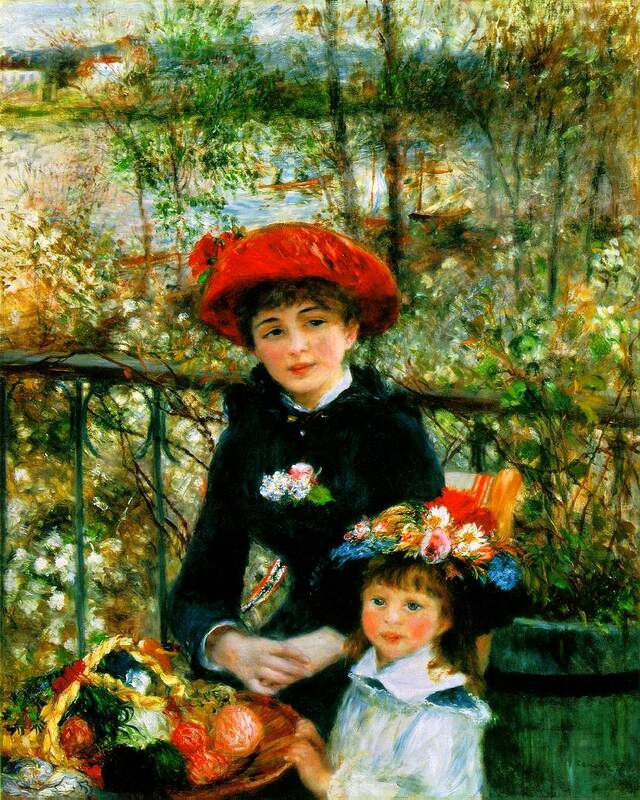 Renoir (an Impressionist painter, 1841-1919) was another artist who came to mind, for joyful, color-filled paintings, so some of those were in the slide show, just for the heck of it. Just to save reformatting a slide show, I started with a Kandinsky (1866-1944) slide show from a few weeks ago, and noticed that he was into color and energy too (you don’t say), and that some of his pictures were very similar to Chagall’s. 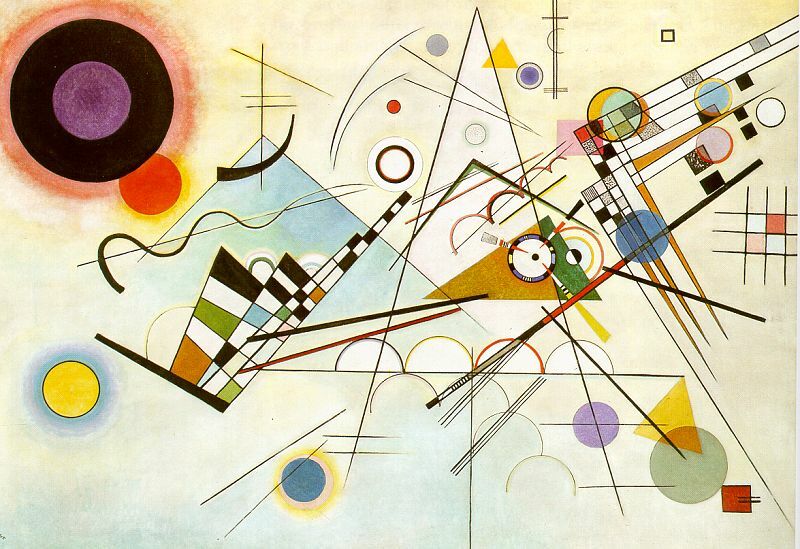 Kandinsky was a contemporary, also born in Russia. In fact, I’ve read that both were inspired by the rich colors of Russian folk art. 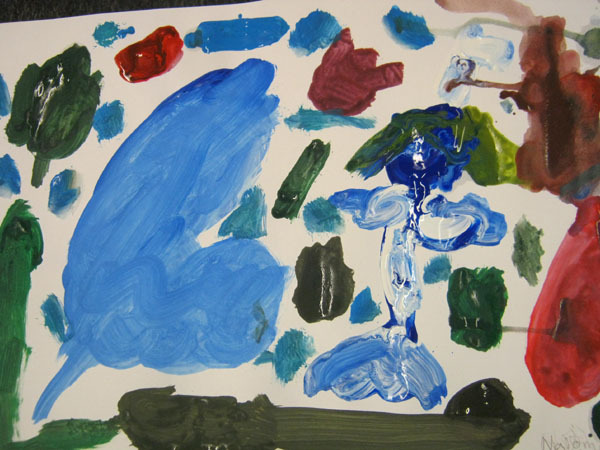 So, while the kids were intrigued by the upside-down people and green faces of Chagall, and wondered who the children were in the Renoir pictures, they were unanimous in choosing the picture they wanted to discuss: Kandinsky’s Composition VIII, which is completely abstract – and full of light, and energy, and color. Kandinsky's Composition viii, 1923, at the Guggenheim. 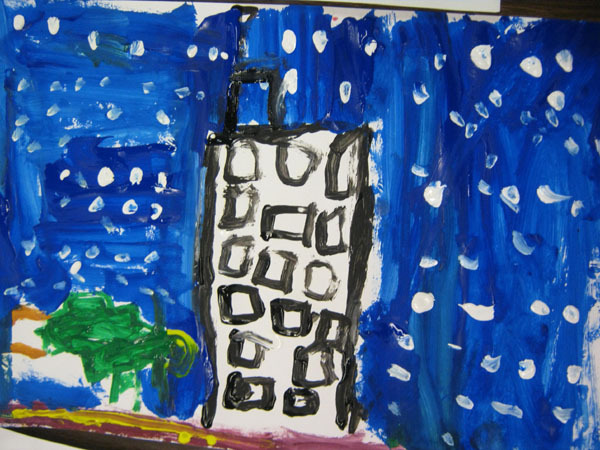 The kids like the game of finding shapes in the picture, which leads to insight into how the picture works – for example, they found shapes like paintbrushes and pencils, which I think is part of the feeling of potential in the picture. They noted that many lines seem to be coming out of or going into the circle at upper right. Then there are the circles like suns, or moons. And, the colors. 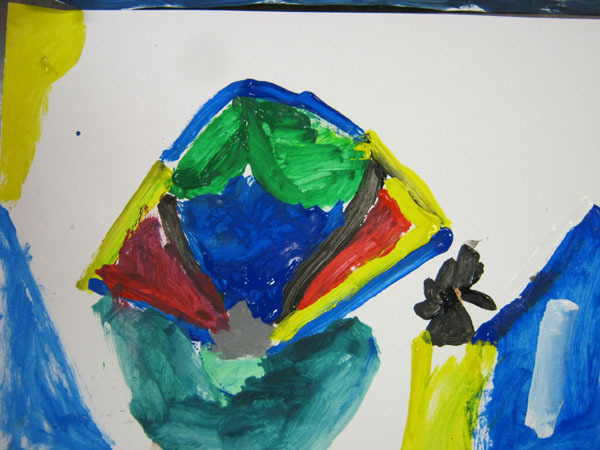 I’d told kids about using complements – colors that are opposite on the color wheel, like purple and yellow – and they found many of these, which also contribute to the bright energy of the picture. It’s also a very large picture, about 5 by 6 feet. I get a feeling of rebirth, potential – kind of like this midwinter Christmas season. 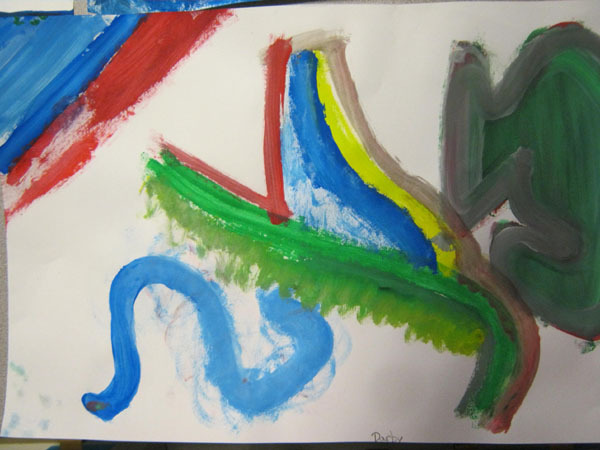 The kids got right into their painting. 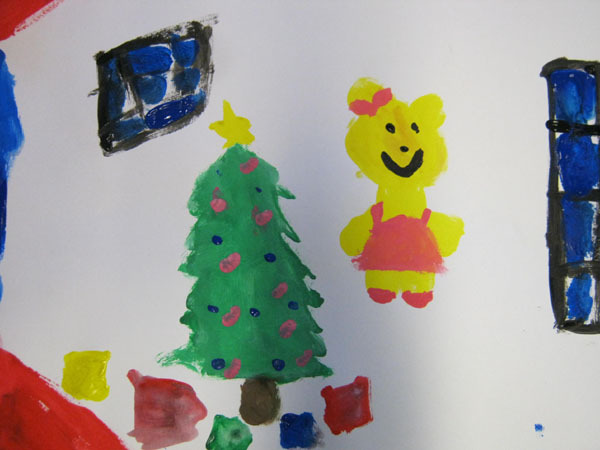 A few made pictures that are abstract, but most made pictures with a Christmas tree and presents. 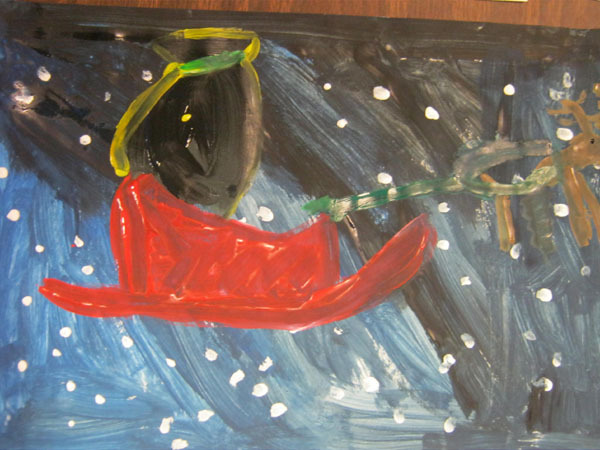 One little girl planned and made a more involved picture, by first painting the paper dark blue-black, then snow, then a sleigh and a reindeer (Rudolph of course). 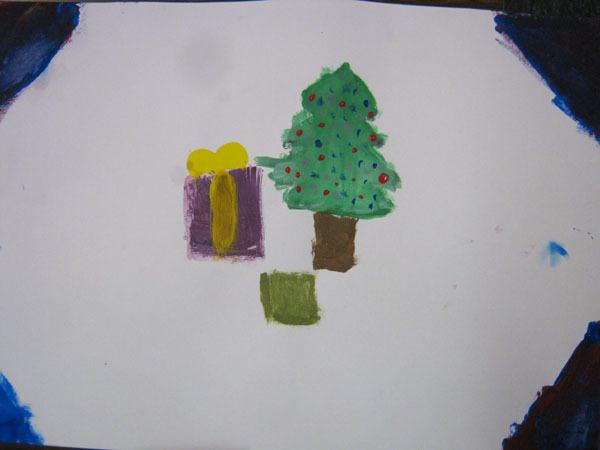 I encouraged the children to mix colors, and to use all the paper, and they had such a good time decorating their trees and painting presents. I think the results are delightful. 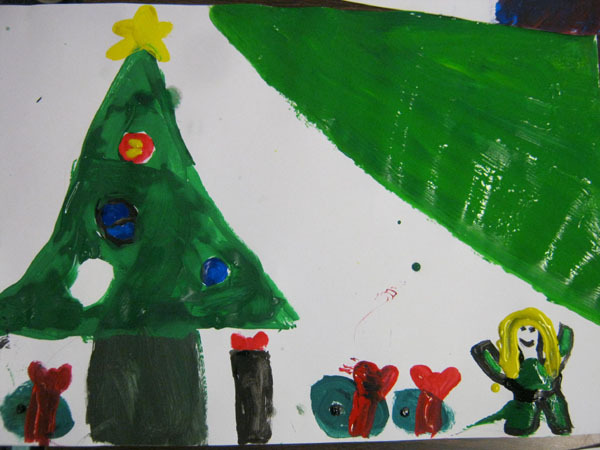 Christmas is a magical time of year and I think the kids expressed their excitement and pleasure in the upcoming holiday. Kandinsky’s Composition viii, 1923, at the Guggenheim. 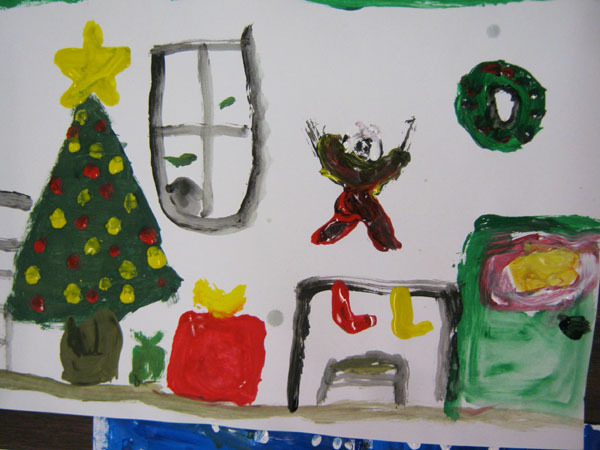 This was a neat project, and the inspiration for starting a blog – to share successful art projects for children. 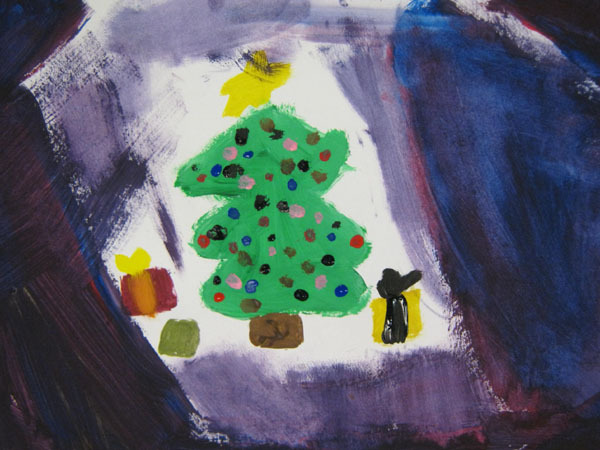 Megan Lindeman taught drawing and painting at the 2011 Sitka Fine Arts Camp, which has a week for grade school children, then two-week residential sessions for middle school then high school students. This project was for kids going into fourth grade up to going into sixth grade. Megan had each student choose an engraving of an animal, and cut it out from the photocopy sheet. Next, they toned a piece of white paper (big – 18 x 24) with vine charcoal. Then, they used the vine charcoal to draw a large version of their animal, trying to use the entire paper. Then they were to fill in the middle tones in the picture using the vine charcoal. They then used Alphacolor Char-Kole (compressed charcoal – super black) to add the darkest tones to the picture. 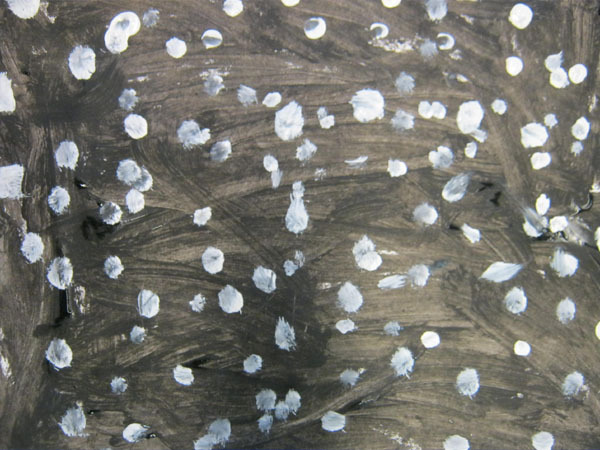 Then they used the eraser to get highlights, and finally used white drawing pencils for the brightest highlights. But that’s not all! 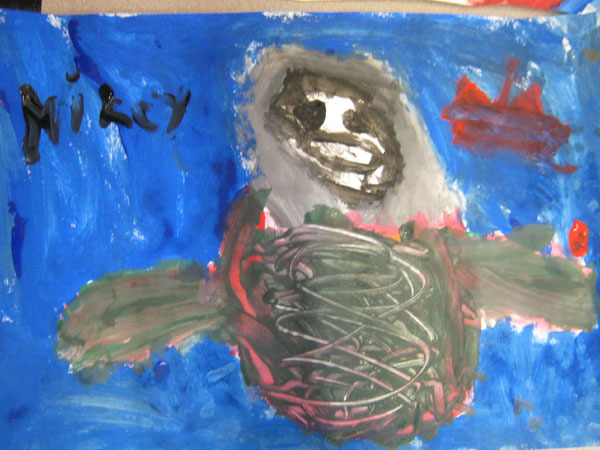 They then used chalk pastels to make vibrant, abstract backgrounds for their animals, and the final touch was collaging scraps of colored – and metallic – papers onto the background. Megan’s original inspiration was an artist in Europe who makes beautiful drawings, then pastes them up into the urban environment, and allows the graffiti and advertisements and grit and posters to happen to his art, and complete it. She had intended to have the kids spray water on the drawings, but they looked so cool the way they were, plus the paper was not very strong. The classes were about 50 minutes, for five days. 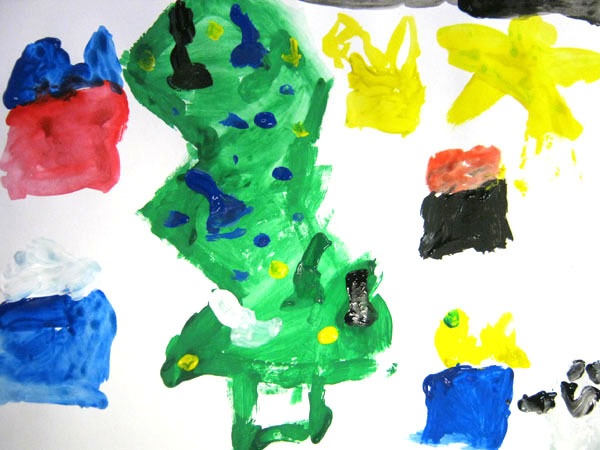 This project took three sessions, then day four she had the kids draw an imaginary bicycle – and the last day, they did a quick acrylic still life. I believe the great art teachers always push the limits – so we had a lot of hair dryers going that last day. And of course it wouldn’t be arts camp without blowing a fuse. The brilliance of this project was that the kids were led through drawing from observation, and modelling with charcoal, without knowing it. I knew a lot of the kids, and a project that engages not only the Artists but the Jocks, that’s a project. They all learned a lot, and were pleased with what they made. This project would work well for kids all the way through high school.